Today I am going to share a few my favorite small space and inexpensive tricks to dress your table. After having lived in basements all over Washington DC for the majority of my life, I have become very adapt at figuring out how to entertain in small spaces. For most of my life, my entertaining haul fit in plastic bins under my bed. Even now that I live in a house, my space is still limited. And, most importantly to note, I do not have a separate and neutral dining room. My dining table is in the great room with the kitchen and living room. So, as much as I would love to have free reign to decorate it, I need to be conscious of the decor in the room. There are few things I love more than dressing a table, even though I don’t do it as much as I wish I did. But, like I said, if I bought a orange and green leave print tablecloth for Thanksgiving, it would stick out like a sore thumb in my room. Instead, I chose to buy a blue and white striped tablecloth. It matches my living room perfectly. And, truth be told, I didn’t even buy it. I bought a few yards of fabric and just sewed it together. It was really easy since the stripes give me lines to follow already! Look at the totally different looks I got out of the same blue and white striped table clothes for Thanksgiving and Christmas. The blue table top fabric on the Thanksgiving table was $1 in the fabric section at the Thrift Store. 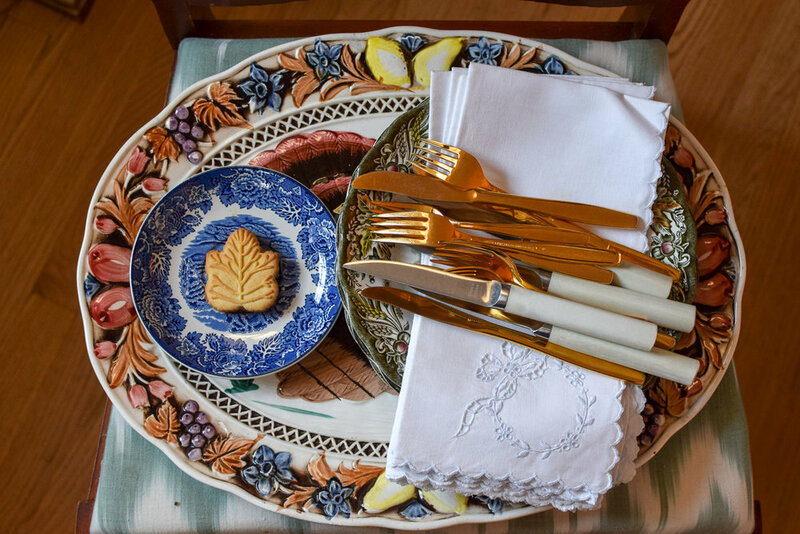 Use white dinner plates for your day to day dining. When having friends over, use them and layer pieces on top of each other. Salad plates are not only cheaper but they are usually easier to find when you are out thrifting. 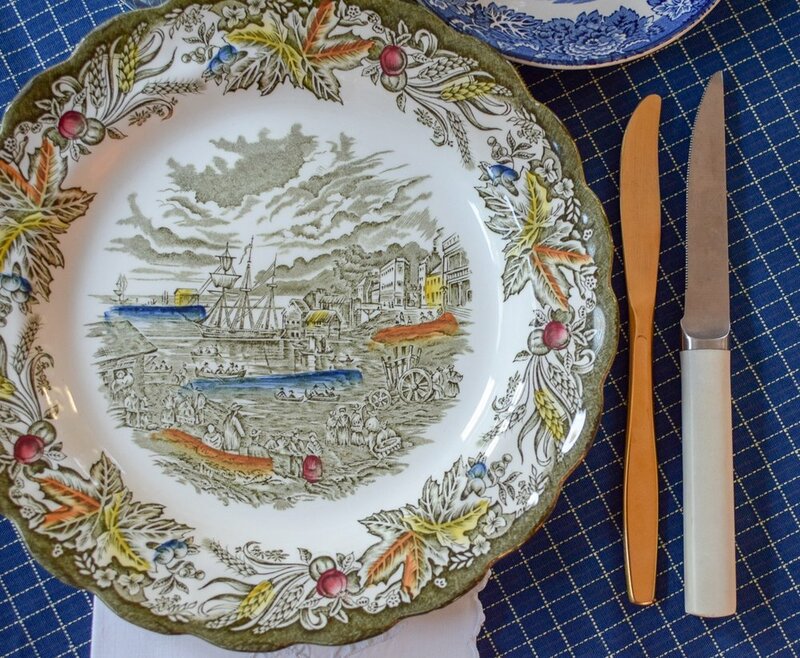 (When a set is broken up in different pieces, the dinner plates are always the first to be sold). I love the two examples below. On the top image, the white plate has a rim, adding a more traditional look. The bottom image has a more modern look with no rim on the white plate. Don’t be afraid to mix your silver and golds. Shiny and matte. Smooth and textured. Mixing all of these creates visual interest on your table. As I said already in post where I outlined the Top 5 Things to Buy When Thrifting, I never ever buy tapered candles full priced. I always get them at a thrift store. Want some white plates? You can easily find them at a thrift store. And, remember, shop that fabric section. You never know what you will find! Vintage Napkins + Beautiful Monogram = New Collab with K Dore Designs! Rummaging 101: Are you a Coup or a Flute?